Jeremy Renner will reportedly star in a new Hawkeye TV series for Disney+. The studio's streaming platform is off to a pretty amazing start with the Loki series and the Scarlet Witch and Vision series, which are also both in development at this time. It has also been rumored that the studio is working on another Marvel Cinematic Universe show focusing on Falcon and Winter Soldier. Disney+ is expected to launch at the end of the year with their live-action Star Wars series The Mandalorian. It looks like the Hawkeye series on Disney+ will star Jeremy Renner as the titular character as he passes the torch to Kate Bishop. Bishop is the character who takes over Clint Barton's version Hawkeye and is also a part of the Young Avengers. There have been whispers about Bishop being introduced in the upcoming Avengers: Endgame, but there has not been any official confirmation at this time. However, the Hawkeye series may have given the Bishop Endgame rumors some more fuel. 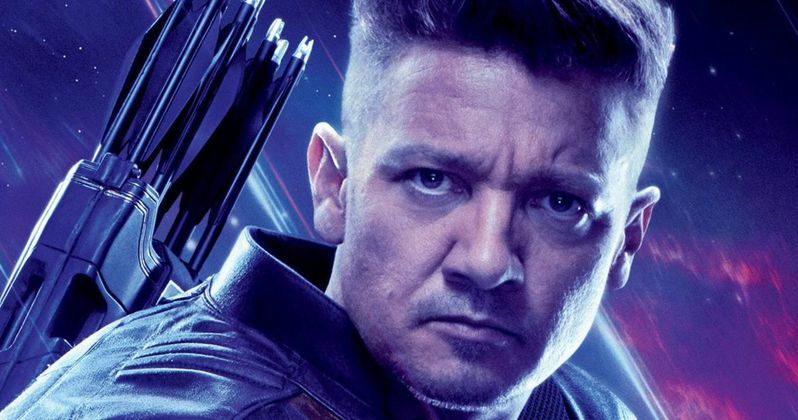 Jeremy Renner played Clint Barton on the big screen for the first time in his uncredited cameo in the first Thor movie. He has since showed up in the Avengers movie, Age of Ultron, Captain America: Civil War, and will be in Avengers: Endgame. Renner famously sat Infinity War out with Paul Rudd and MCU fans were initially pretty bitter about the situation and kept looking for clues for his surprise return in the promotional material. However, it looks like it's a good thing Hawkeye and Ant-Man took a breather while Thanos completed the Decimation. MCU fans are very happy to see Renner back and will more than likely be pretty happy about the new series. The Hawkeye series, like the other MCU TV shows, is expected to consist of six to eight episodes. The show will be produced by Marvel Studios and Kevin Feige and it is expected to have a larger budget, like The Mandalorian. Feige has expressed excitement about the Disney+ shows, revealing they will be able to tell much more in-depth stories than they can get away with on the big screen. This all sounds very promising, but fans are all probably waiting to see how The Mandalorian pans out before getting any real excitement up. Disney is pretty much unstoppable at this point in time, but will this lead to MCU fatigue? The Star Wars franchise has had to dial it back a notch after fans reacted in a negative way to the short amount of time between The Last Jedi and Solo: A Star Wars Story. The MCU seems to be doing pretty well at balancing everything while putting the focus on other characters, but the new shows on Disney+ could end that streak. We'll just have to wait and see when the shows finally come out. Variety was the first to announce the Hawkeye series starring Jeremy Renner.